“Playing at the Dozens” or “Putting in the Dozens” is a folk game in which two or more participants hurl insults and boasts at one another. These highly imaginative and metaphorical comments are invariably obscene, frequently pornographic, and always aim to disparage an opponent’s genealogy. The origin of the Dozens is unclear, but it seems to have gotten started sometime in the late 19th century in the African American culture. Indeed, the most fervent and creative practitioners of the Dozens are adolescent black males. Because of the folk origin of the Dozens, it has been extensively scrutinized and analyzed by folklorists, sociologists, and musicologists. Folklorist Roger Abrahams did an extensive study of black verbal contests on the streets of Philadelphia, and blues historian Paul Oliver, in his books “Screening the Blues” and ”Big Road Blues,” devotes considerable ink to the link between the Dozens and the blues. A later variant of the Dozens called” Toasts” has also had its impact on the blues. Toasts use the same rhyme schemes and scabrous imagery as the Dozens, but are presented as dramatic recitations rather than ritualized insults. The most popular and pandemic of these narratives is the “Signifying Monkey, ” which involves the escapades of a cheeky primate and that King of the jungle. A Toast is delivered in a syncopated sing-song, not unlike the ubiquitous “Rap” of today. Speckled Red’s real name was Rufus Perryman. He was born in Monroe, Louisiana in 1892, but his family moved to Hampton, Georgia, near Atlanta, me when he was an infant. His nickname came from the fact that he was an albino, a condition that caused his skin to have a reddish, speckled appearance. He didn’t show any special interest in music until after he moved to Detroit when he was a teenager. At the time that Red arrived in Detroit, the local blues scene seemed to be dominated by piano players such as Will Ezell, Charlie Spand, and Big Maceo Merriweather, all of whom had migrated from Georgia. Speckled Red was attracted to the barrel houses all along Hasting Street, the thoroughfare that ran down the middle of Detroit’s African American community, and he fondly recalled his mentors – Tupelo Slim, Paul Seminole, and one known only as Fishtail – who never had the opportunity to leave their music on records. It was from Seminole that Red learned of the versions of the Dirty Dozens that made him famous. Red started finding work as a piano player and singer in some of the Hasting Street bars, and for a while he was in a band called the Wolverine Nighthawks. In the 1928, Red teamed up with legendary Memphis songster Jim Jackson, noted for his hit recording of “Kansas City Blues” to tour with the Red Rose minstrel and medicine show. The tour took them through Mississippi, Arkansas and Alabama, before they returned to Memphis. Red settled in Memphis for a while, playing with Jackson in Beale Street joints, and he recorded with him for the Vocalion and Brunswick labels in 1929 and 1930. In spite of being practically blind, Red later hoboed extensively throughout the South and Midwest. In 1941, Red moved to St. Louis. He spent the rest of his days playing in the St. Louis clubs with occasional tours out of town, including some to England and Europe in the late fifties and early sixties. 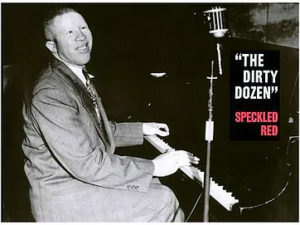 In 1956, Red recorded for the first time since 1938, and one of the sides on this session was the Dirty Dozens. Speckled Red died in St. Louis in 1973 and he is buried in the Oakdale Cemetery.